Brush Wizard: WIP - Finger Painters "Halloween": Skeleton, Sorcerer and Barbarian Painted! 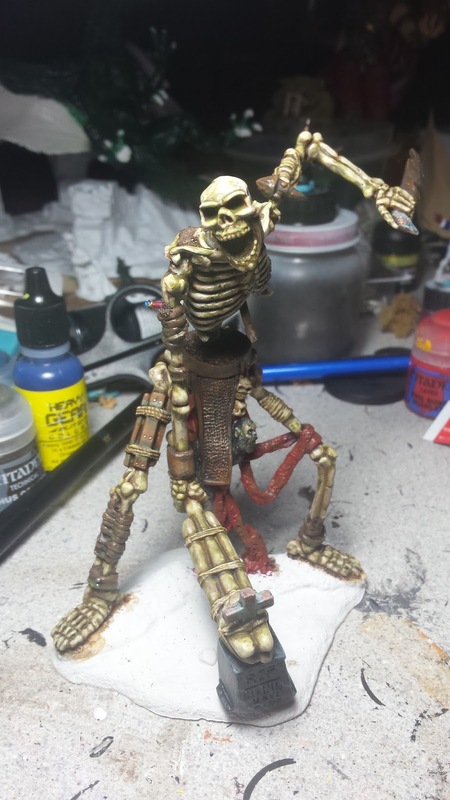 WIP - Finger Painters "Halloween": Skeleton, Sorcerer and Barbarian Painted! The skeleton has been finished along with two of the heroes, the Barbarian and Sorcerer. I'm super pleased with all three of them, the skeleton especially, he looks nice and rotten. I've also reworked the layout one final time, and started preplanning how I want it to end up looking. details that seemed to crop up while painting it. But this has to be the best bone I've ever painted! I especially like the way the tombstone hammer turned out. 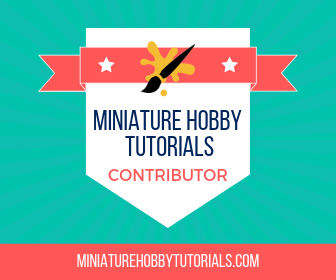 I borrowed Mengel Miniatures' technique for painting black marble for it. 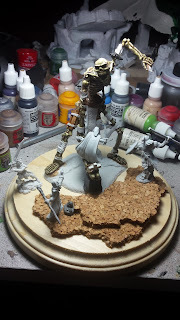 Once the skeleton was painted, I decided to work on the base, adding more cork to it. 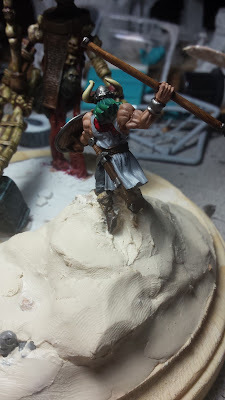 I decided that I didn't like the brick wall that the barbarian was jumping over, since I don't have the sculpting skills to make an extension to it. off a large boulder and would sculpt clay around the bricks to hide them. Then once it was all painted, no one would be the wiser and we'd have a more dynamic layout! I started work on the caster next, originally I was calling him a wizard, but I see him more as a sorcerer now. 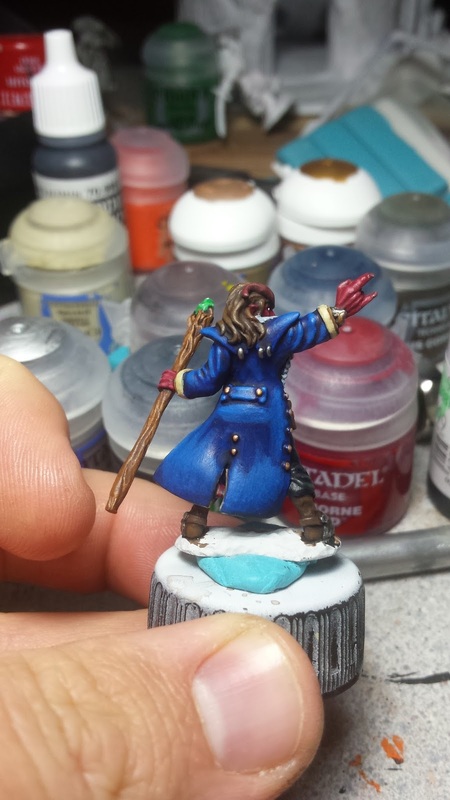 His coat screamed English Navy circa 1800 to me, so I had to paint it up as such. It might also be the best attempt I've done on highlighting blue too. 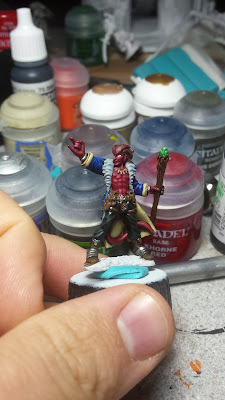 His skin was painted using Khorne Red (surprise, surprise), mixed with yellow to build up the highlighting. I also like the way his pants turned out. I started with a black base coat and mixed in some green for highlights. It seemed to give me a more realistic highlight, over using grey. I then moved on to the Barbarian/Viking warrior. I wasn't sure how I wanted to paint him though, and i knew the rogue was already going to be dark colors and I didn't want everyone to be super dark. 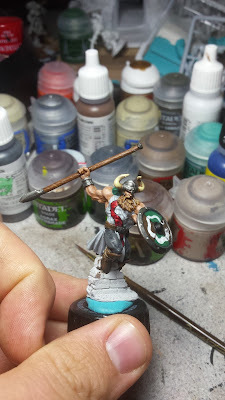 So I decided on a white tabard and grey pants with a bit of green for color. Once he was painted though, I realized that his tabard looked really plain, thanks to the light grey/white. So he needed something else. 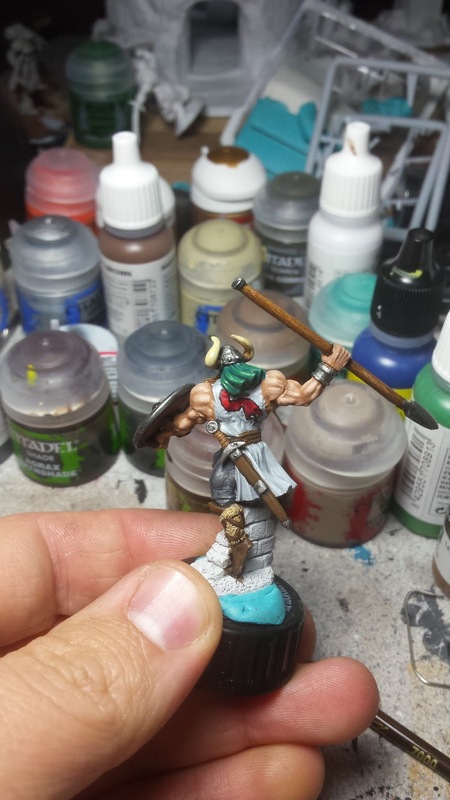 I had already decided on a snake symbol on his shield, so I thought "why not add a snake to the tunic as well?". But I needed to choose a color... out came Khorne Red again (I have a problem). With the skeleton, sorcerer and barbarian all finished, it was time to start working on the base. I started with the Barbarian and glued him into place. Then taking my handy dandy clay I started layering it on to form the rock he's jumping off of. see how it turns out once the drywall filler and paint are on it. 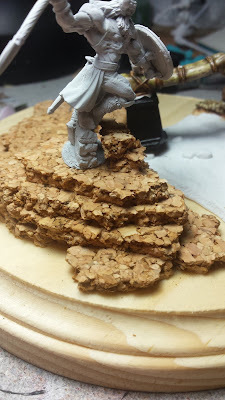 Next up I glued the sorcerer into place and filled in around him. I made sure to place the skeleton in his spot as well, so his aim was correct. Then pinned him down and blended the clay to his base. 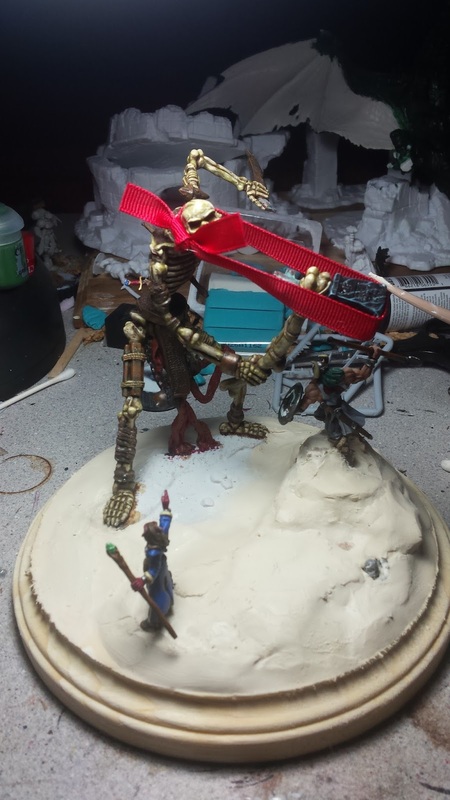 Finally, I glued the Skeleton into place and put his clay down. But his hammer was in the way. So thanks to a bit of ribbon, I was able to strap his arm up for a bit. Luckily Bones minis are bendy and I can do things like this. If it were metal or resin, no such luck. With all that drying. I started working on the female warrior. But I didn't want to paint plain silver armor for some reason and had the idea to mix in a bit of green with it. 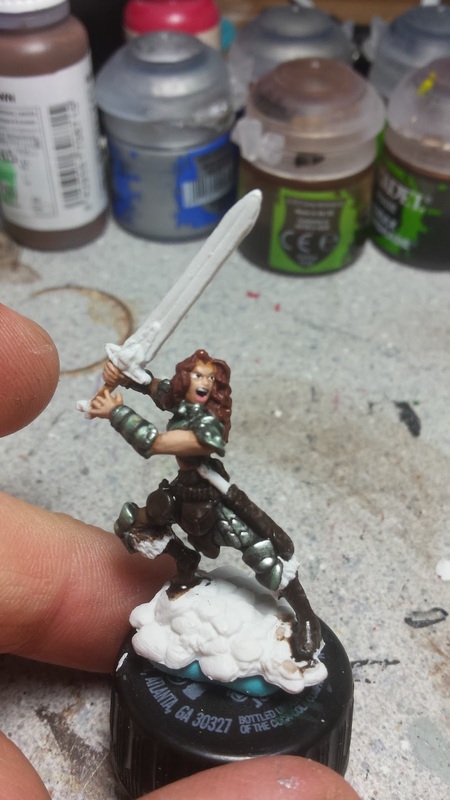 So thanks to some Vallejo black, Intermediate Green and Ironbreaker silver, she got some fancy green tinted armor! Progress is moving along nicely on this project and I should have no problem finishing it for the Oct 31 deadline. Check back later for more WIP goodness, or you can follow me on Twitter @ryglore for updates as things happen.